Do you buy Ex-Library books? Yes, we gladly accept Ex-Library books. All books must meet our condition guidelines. An Ex-Library book should be quoted using the ISBN for 'Library Binding' if it is available on the back of the book or the copyright page. Most Library books do not have their own ISBNs, though. These various editions have a payout between 50% and 75% of the normal price you see for 'Standard US Edition'. 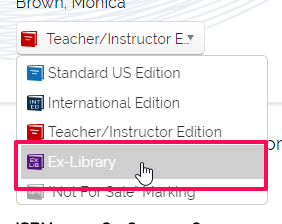 To quote one of these items, you must choose the "Ex-Library" option from the edition drop-down.